I start with A, since this is the pattern setting genes. This is the first thing you will notice about your rabbit, if it is Agouti, Tan Patterned, or Self. A rabbit will have its "Visual" gene and then can carry another identical one(Homozygous), or any one BELOW it on the series, but NEVER ONE ABOVE IT...that would mean that the rabbit is NOT the color you said it was in the first place (i.e. : A Self carrying Agouti. The Agouti is dominant, so the rabbit would be AGOUTI marked). Hence, a Rabbit that is Agouti colored can carry another Agouti gene, a Tan Pattern gene, or a Self gene. A Tan Patterned rabbit can he Homozygous for Tan Pattern, or carry Self. A Self Rabbit can *ONLY* be Homozygous for another Self gene as there is not one "Below it" to carry. Some Examples of this in "color talk": 2 Castors bred together can potentially produce Castors, Otters, and Solids. 2 Tan Patterned animals bred together can potentially produce Otters and Solids. 2 Solids can ONLY produce more solids. When speaking of the term SOLID, we mean that the entire animal is colored. There is no banding in the hair shaft, and no Agouti like markings on the coat. The color Tortoise, which has incorrectly been called a "Shaded" from time to time, is a SELF color. The E series plays a role is where the "Shading-Like" color is distributed, and will be discussed at a later time. A REW, although can genetically be any COLOR under it's "white sheet" will also follow the same basic genetic principals. It IS a "SOLID" animal though, meaning that its body is the same color from nose to tail. The REW's coloration, or better yet, lack of coloration is from the albino gene on the C Series which prevents pigment from developing on the actual hair shaft and eye. The C Series will also be discussed in great detail in a later article. What is nice about knowing genetics and your rabbit's Genotype and Phenotype is when purchasing animals that come from GENETICALLY IMPOSSIBLE backgrounds. Someone obviously made a mistake on the pedigree...it happens to all of us. There are also colors that "mimic" others, and unless you know the Genotype, these colors in mime can really throw a wrench into your breeding program. Also another thing to remember, is that because a color is not recognized in your breed's STANDARD, does NOT mean that is cannot exists in your BREED! Recessive genes can be hidden for many many generations, and can only produce themselves when they meet up with another like or more recessive gene. Otter X Self - Agouti (Neither parent has an Agouti gene to give). I am making a notation of these genetic impossibilities because many people who are just starting in rabbits are purchasing more stock than breeding them. They purchase animals at shows or fairs, and many times, the parents of the sale animal is not present for inspection of it's correct color. I recently went to a show where a LILAC TORTOISE Mini Rex was on the table in the "LYNX" class. This animal should have been Disqualified for being not only in the wrong variety, but a NON RECOGNIZED COLOR. He was judged and placed, and after that, I wasn't able to change the exhibitor's mind in regards to his TRUE and CORRECT coloration. I hope no one has to rely only on a judge to interpret colors, as each and every person who becomes familiar with their genetics can eventually call the shots, and make their selection of replacement breeding stock a little more effectively....ON THEIR OWN!!! If an Otter rabbit has one parent being an Agouti, and one Parent being a Self on the pedigree, this becomes easier. *We know from reading above that the Self can only ever carry itself, so the self parent is "aa". * We know that the Agouti parent is dominant for "A", and since it produced an Otter baby, it MUST BE recessive for "a(t)". Just by that basic information, we know that the Otter rabbit in question is "a(t)a", one gene from each parent. 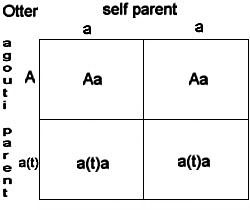 And the Self parent is "aa", and the Agouti parent is "Aa(t)". In percentages, each kit has a 50% chance of being an Agouti animal that is recessive for Self and 50% of being an Otter animal that is recessive for Self.